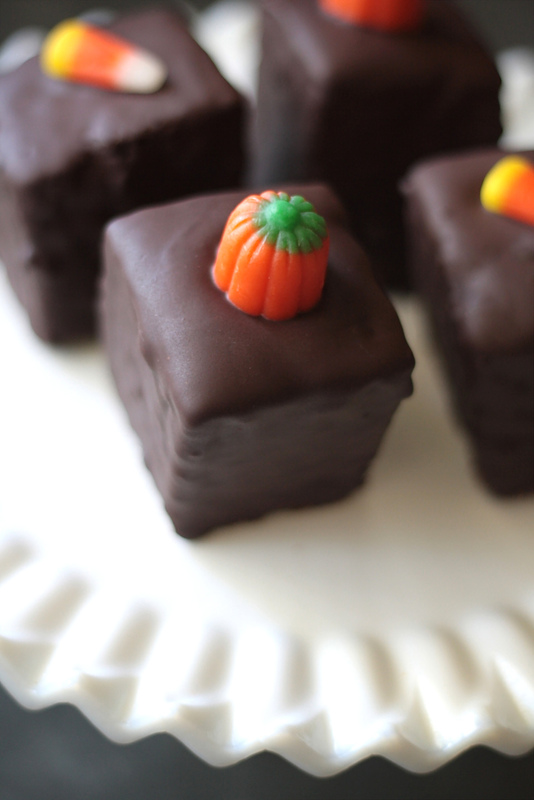 Pumpkin bread petit fours are perfect to have on hand for entertaining family, friends and last minute guests as the holiday season unfolds. 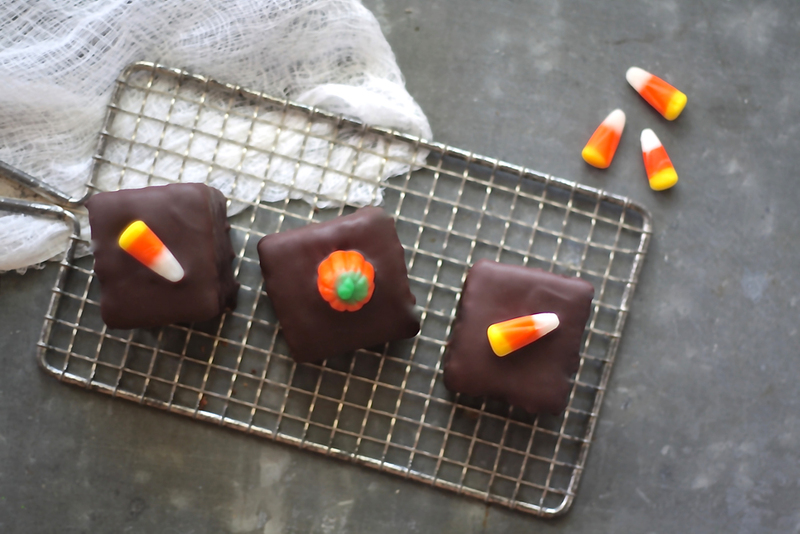 These delicious little pumpkin bread packages wrapped in dark chocolate will pair perfectly with a hot cup of coffee or tea. Or maybe champagne? Oh is it a happy day here at Wenderly!!! For months now My Yanni and I have been discussing, drawing out plans, discussing again, picking fonts, changing fonts, redesigning logos & icons, discussing more, picking out font sizes, drawing layouts, comparing color palettes, agreeing on layouts, then changing layouts, creating categories, drawing graphics, making multiple lists and checking them thrice. Then one day after discussing and refreshing the page for the umpteenth time and holding our breath for what seemed to be an eternity…the new Wenderly was born. And here it is. Pop the bubbly! 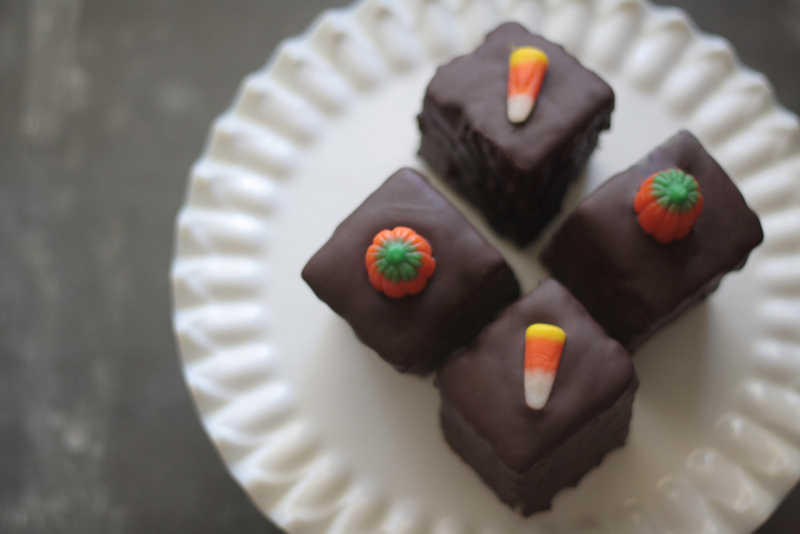 I made pumpkin bread petit fours to celebrate! I hope you’ll join me! It seems only appropriate that Wenderly be reborn in Autumn. I simply adore the beautiful transformation of the warm humid air into crisp clear days, the abundant harvest of perfect pumpkins and tart apples and I especially love the parade of color that seems to happily saunter down every avenue. It gives me a totally new outlook on life. A fresh perspective. And a craving for nestling into creativity and capturing all the senses. 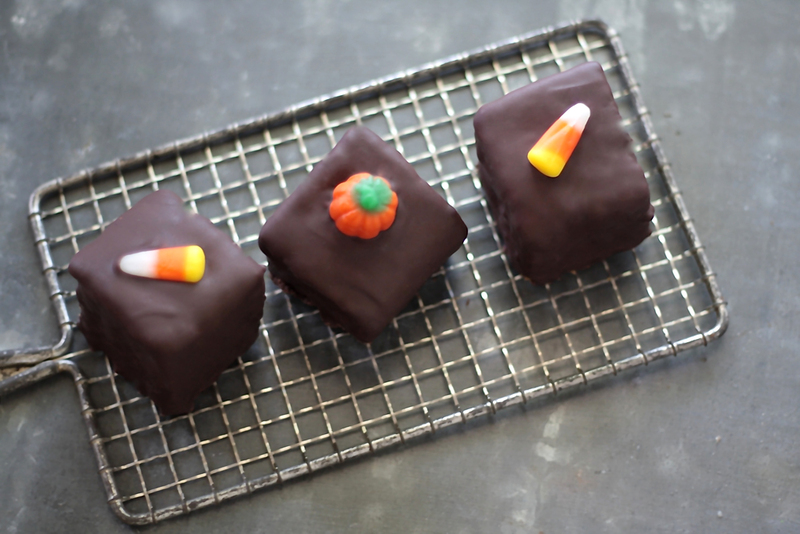 These pumpkin bread petit fours were inspired by all of those things. And they’re as easy as can be. 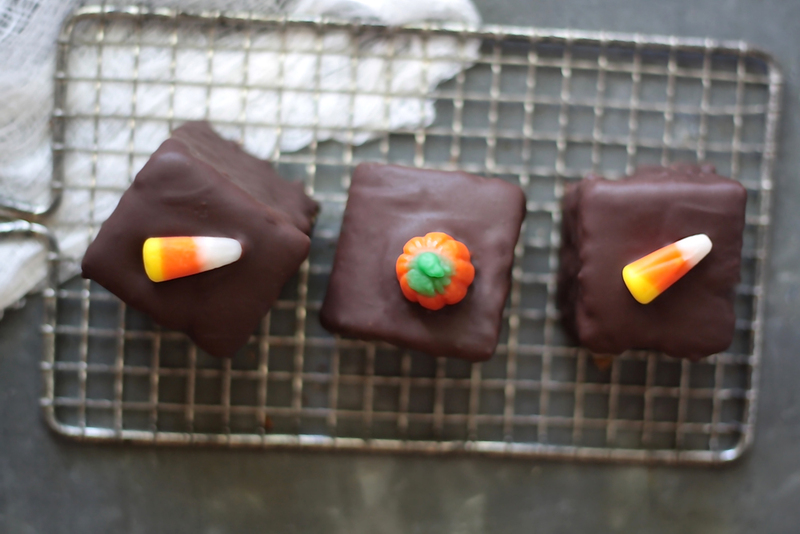 I just used my favorite boxed pumpkin bread, made a scrumptious chocolate glaze and then topped them off with festive little candy corns & pumpkins. 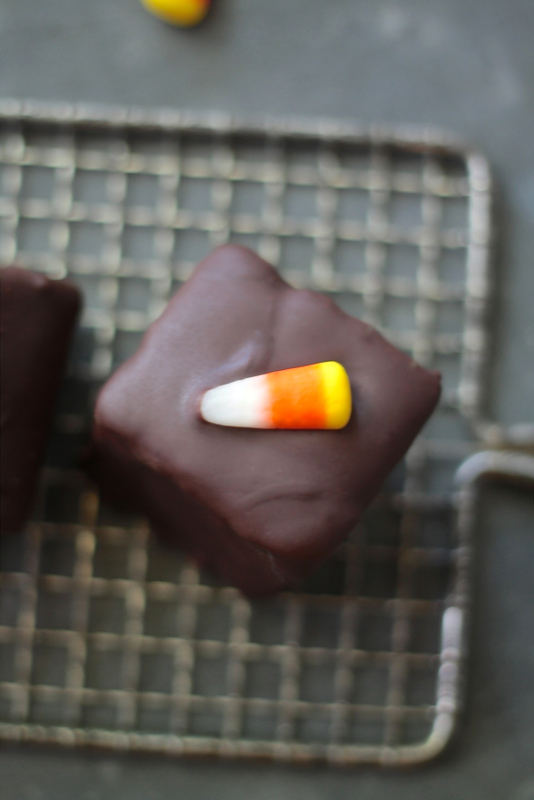 A decadent taste of autumn all wrapped up in a dark chocolate coating is the perfect way to celebrate all the wonderful changes going on in the world outside as well as in my little world online. Not to mention, they make a delightful treat to have on hand for those who gather in your home this holiday season. I can’t even begin to tell you how happy I am that you’re here. Whether this is your very first time or you’ve been stopping by for awhile, I do hope you’ll join me as I venture on in this most exciting world of sharing what I love to eat, decorate, make and inspire with each of you, for a long time to come. Cheers!! Thank you honey!! And thank you for all of your hard work! I be a lucky lady! LOVE the new site, pretty lady. It’s gorgeous! Just like you 🙂 These little cakes are sheer genius. So fun for the holidays! Love this!! Everyting is so lovely… so excited for you! Awwwwww, thanks so much sweet Amanda!! Popping the champagne with you! Love the new look; love these petits fours! Thank you Bridget!! Wish we could share a glass of bubbly together! !